Earlier this year we saw Snapchat amplify their commercial operations by making sponsored Geofilters more widely available to marketers and advertisers. It seems they’ve quickly realised the earning potential, amping it up another notch; now making it possible to create custom Geofilters from the palm of your hand. Up until this point, the only way to design Geofilters was with image editing software, or Snapchat’s web tool. Not only this, but they needed to be submitted for review and approval via the Snapchat website, which was hardly a viable last minute option for users. The new feature allows users to create Geofilters in the Snapchat app by heading to their Settings and selecting ‘On-Demand Geofilters’. The in-app feature works pretty similarly to the web tool. providing a range of templates from Birthdays to Weddings, making it super simple for even the least savviest tech user. Snapchat still recommend all Geofilters be submitted for review and approval at least 1 day prior to the event, however, the new in-app feature seems to work on a much faster approval turn around time, making it a more viable last minute/impulse option for users. So while it’s still not quite there for marketers, in terms of customisation and sponsored geolocated filters, it certainly provides a glimpse into the future of geolocation marketing, and the tools that will be available for marketers. 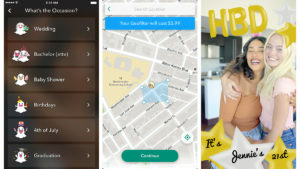 And with the introduction of Snap Maps only last month, it’s only a matter of time before Snapchat monetise these new features, and make them widely available to marketers and advertisers.